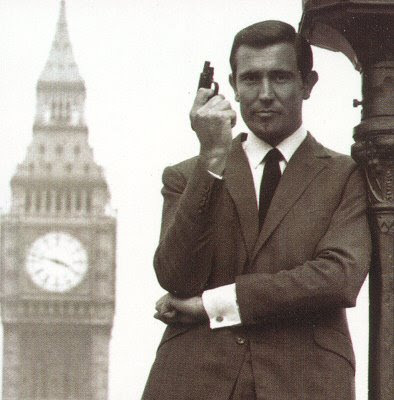 George Lazenby: the man who (briefly) replaced Sean Connery as James Bond. I can't wait to meet this dude! Keeping the vibe of old school fandom alive, Michael Carbonaro’s always-welcome Big Apple Convention once more sets up shop this weekend at Manhattan’s Penn Plaza Pavilion and celebrates the release of the twenty-second film in the James Bond series, QUANTUM OF SOLACE, with featured guest appearances by actresses Gloria Hendry (LIVE AND LET DIE), Lynn-Holly Johnson (FOR YOUR EYES ONLY), and George Lazenby, the man who took over when original Bond Sean Connery left the series, going down in film history as 007 in what many fans consider to be the best film of the bunch, 1969’s exceptional ON HER MAJESTY'S SECRET SERVICE. Also in attendance will be Kate Mulgrew (aka STAR TREK: VOYAGER’s Captain Janeway), Peter “Chewbacca” Mayhew, and a host of others to meet and greet. And let us not forget a roster of luminaries from the comics industry, including Jon Romita Sr., Jim Steranko, Bill Sienkiewicz, Carmine Infantino, Larry Hama, Herb Trimpe, Mark Texiera, Michael Golden, Neal Adams, Russ Heath and a galaxy of the four-color world’s best and brightest. And as if all that doesn’t set your fan-flag a-wavin’, there’s also a mid-boggling assortment of shopping to be had, provided by dealers of all manner of collectibles ranging from toys to original art to rare comics and who knows what else? It’s a cornucopia of keepin’-it-real convention excellence for a mere twenty bucks admission, so what are you waiting for? Yer Bunche will be covering it in all it's geeky glory and I'll have the whole story for you on Monday or Tuesday. The Penn Plaza Pavilion is easily accessible from the A, C and E trains (Penn Station stop) and conveniently located directly across the street from Madison Square Garden and Penn Station at 401 Seventh Avenue at 33rd St. For more information, consult the Big Apple Con website .